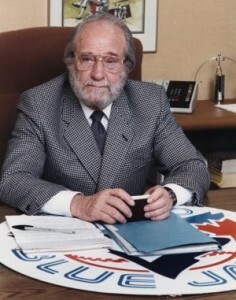 It was largely through Peter Hardy’s efforts, as chairman of the board at Labatt’s, that the city of Toronto was able to land a major league franchise. The vice-chairman of the Blue Jays’ initial board in 1976, Hardy was directly involved in the hiring of Peter Bavasi, Pat Gillick and Paul Beeston. He would later become board chair, and, in 1981, the club’s chief executive officer (CEO). Hardy fostered a family atmosphere while he was CEO, offering minor league managers time off during the regular season and ensuring that minor leaguer players were afforded nutritional meals. During his reign, he also endorsed decisions to hire Bobby Cox, Jimy Williams and Cito Gaston as field managers. After the Blue Jays captured their first division title in 1985, Sports Illustrated selected Hardy as Major League Baseball’s top executive.